Fayose said this in reaction to the victory of Ademola Adeleke at the tribunal. Adeleke, candidate of the Peoples Democratic Party (PDP) in the 2018 governorship election in Osun state, was declared winner of election by the tribunal on Friday. At its sitting in Abuja, the tribunal held that the rerun election conducted in the state after the initial poll was illegal. The Independent National Electoral Commission (INEC) had announced Gboyega Oyetola of the APC as winner of the September election. 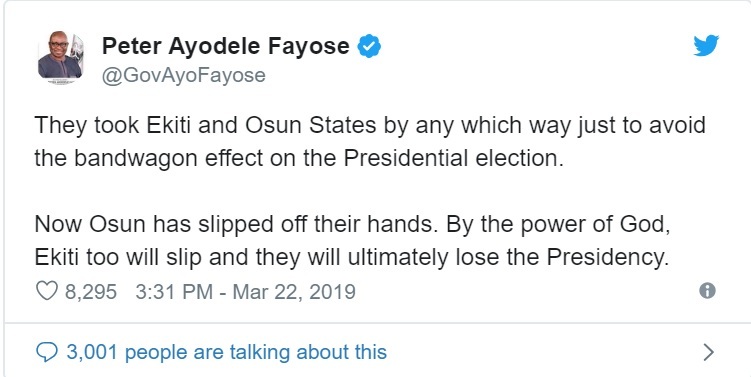 Writing via his Twitter handle, Fayose also said the ruling party will ultimately lose the presidency. “They took Ekiti and Osun States by any which way just to avoid the bandwagon effect on the Presidential election,” he tweeted. 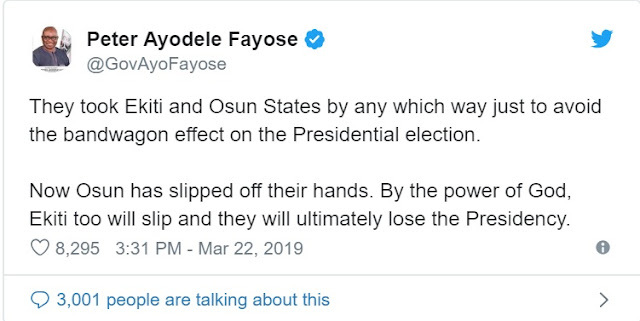 Kolapo Olusola, candidate of the PDP, had lost the governorship election in Ekiti to Kayode Fayemi, the incumbent governor. Subsequently, Olusola and the PDP filed a petition at the tribunal to challenge the result of the election. They alleged that the election was manipulated using federal might. 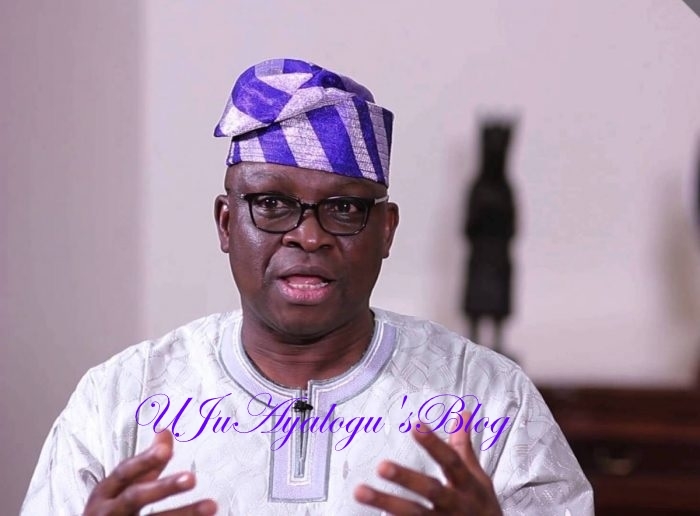 Having lost at the tribunal, Fayose and his party headed to the appeal court.